Get excited, Bobcats – a national championship game is coming to Hamden! Although the hometown Quinnipiac women’s ice hockey team is no longer in contention for the NCAA women’s ice hockey championship, four of the nation’s finest teams will be in town this weekend to duke it out for the most prestigious prize in collegiate women’s ice hockey. No. 1 Wisconsin, No. 2 Minnesota, No. 4 Clarkson and No. 6 Cornell comprise the field of competitors for the Frozen Four. Minnesota and Cornell will face off at 4 p.m. on Friday, while the puck drops for Wisconsin vs. Clarkson later that night at 7 p.m. The national championship is scheduled for Sunday afternoon at 2:30 p.m.
Before the games begin, let’s take a quick look at the competitors for this year’s crown. Wisconsin is no stranger to the Frozen Four. They have made the big dance for six straight years, but have not won a national title since 2011. Over that span, they’ve lost almost every way imaginable, from a double overtime heartbreaker to Colgate in last year’s first round, to getting shut out in the 2016 finals by Clarkson, to four deep tournament losses in five years to Minnesota. Luckily for the Badgers, this is a different hockey team that will not be defined by past years’ shortcomings. 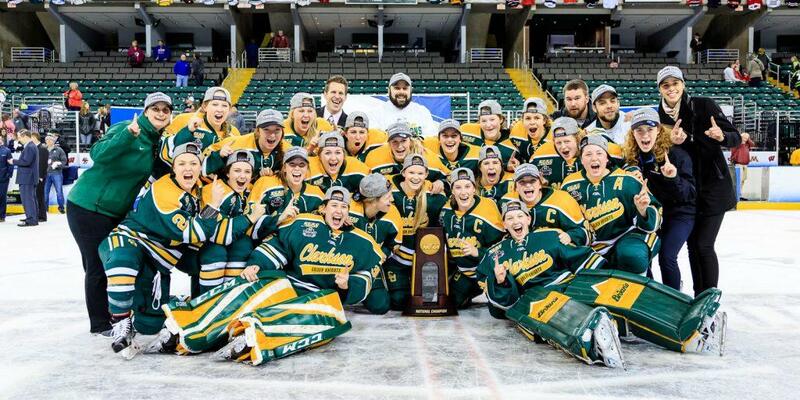 The team hasn’t lost since February 1, and boasts the best record in NCAA women’s ice hockey. Their high-powered offense features three 20-goal scorers and 11 players with 17 or more points. They’re also backstopped by redshirt junior goalie Kristen Campbell, who has not allowed more than three goals against in any of her 39 games. The Badgers are hungry for the championship that has eluded them for so long. In order to get to the finals though, they’ll have knock off Clarkson, the defending champions, first. This is not the first time that Hamden has hosted the Frozen Four. The People’s United Center was also the site for the 2014 Frozen Four, which saw Clarkson win its first national championship. Five years later, Clarkson has added two more titles to its trophy case, which came back-to-back in 2017 and 2018. While Clarkson is still the class of ECAC Hockey, this year was a little tougher than most for the Golden Knights. Their record, while still solid, was the team’s worst since 2015. The Golden Knights had a hard time against some of their competition on the way here, including Quinnipiac, which played three close games against Clarkson this year. Clarkson also barely squeaked by Boston College in the first round of the NCAA playoffs with a 2-1 overtime win. Of course, Clarkson still has the most star power in the tournament. Loren Gabel has over 200 career points and is a finalist for the Patty Kazmaier award (MVP) for the second straight year. Kassidy Sauvé is a brick wall in goal. Elizabeth Giguere is the best underclassman in women’s ice hockey. And of course, former Bobcats legend T.T. Cianfarano is back in the town she called home for four years, looking to win a championship in enemy colors. This isn’t the best Clarkson team of their dynasty, but they are still legitimate contenders. After all, coach Matt Derosiers and his players have two things the rest of the field do not have – championship rings on two fingers. The Golden Gophers are one of the most successful teams in NCAA ice hockey history. They have made seven of the last eight Frozen Fours, and have won championships in six of those years. While they fell short last year, Minnesota has consistently held one of the top two seeds in the USCHO rankings this year and look primed for a deep tournament run. This season marks the Golden Gophers’ best year since 2016. The team averages a whopping 4.1 goals per game and allows just 1.8. Eight of their players have at least 10 goals, and no one on the team is a “minus” in plus-minus. Between the pipes, Minnesota is in the fortuitous position of having two trustworthy goalies – sophomore Alex Gulstene and junior Sydney Scobee both have excellent numbers. Minnesota may be the most complete team in this tournament. Don’t be surprised if the Golden Gophers are the last team standing at the People’s United Center. While many expected the other three teams to be in the Frozen Four, Cornell was a bit of a surprise qualifier for the big show. It’s the Big Red’s first Frozen Four since 2012, but they are looking to make up for lost time. The Big Red certainly didn’t take the easy way to get in. Coming off of a loss to Clarkson in the ECAC Hockey championship game, Cornell beat #3 Northeastern in overtime in the NCAA first round to make its way to the Frozen Four. Cornell’s calling card is its defense. They only allow 21.5 shots against per game, and just 1.7 goals against. The Big Red’s offense is a step below the prolific levels of Clarkson, Minnesota and Wisconsin, but still one of the best in ECAC Hockey. One thing’s for sure – Cornell has shown that opponents cannot take them lightly. Minnesota may look better on paper, but Cornell has ridden a wave to get where it is, and is full of confidence.